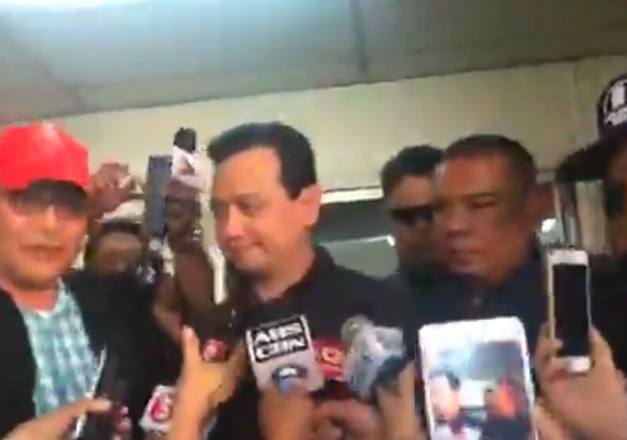 MANILA – Senator Antonio Trillanes IV arrived in Davao City to face libel cases filed against him by Presidential son and former Davao City vice-mayor Paolo Duterte and Duterte’s son-in-law Manases Carpio, Tuesday, January 15. The opposition senator has set foot in Duterte’s hometown for the first time since he was declared persona non grata almost a year ago when he declared the President’s hometown as the most dangerous city in the country. The younger Duterte and Carpio earlier filed libel cases against Trillanes . The case was based on the senator’s claim in 2017 that the younger Duterte and Carpio were involved in shabu smuggling and extorting money from ride-hailing firms. His arraignment was set for 8:30 am at the Davao City Regional Trial Court Branch 54, at the sala of Judge Melinda Alconcel Dayanghirang. The court earlier ordered Trillanes’ arrest and set bail at P24,000 for each of the four cases of libel, with a total of P96,000. The senator then posted bail in Pasay City, which prompted a Pasay court to lift the warrants of arrest against Trillanes and issued a certificate of voluntary surrender.